H. Rick Bamman - hbamman@shawmedia.com Disc golfer Jamie Martinez plays out of the rough on the second hole at the newly installed Quarry View Disc Golf Course in Algonquin on Wednesday, Nov. 22, 2017. The Algonquin resident pitched the idea of creating a nine-hole course to the village back in 2013, and his design was brought to life two weeks ago. H. Rick Bamman - hbamman@shawmedia.com Disc golfer Jamie Martinez plays the first hole of the newly installed Quarry View Disc Golf Course in Algonquin on Wednesday, Nov. 22, 2017. The Algonquin resident pitched the idea of creating a nine-hole course to the village back in 2013, and his design was brought to life two weeks ago. 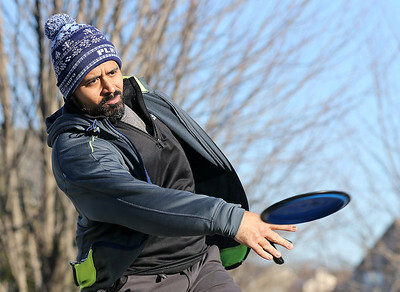 H. Rick Bamman - hbamman@shawmedia.com Disc golfer Jamie Martinez of Algonquin shows good form while playing a practice round Wednesday, Nov. 22, 2017 on the Quarry View Disc Golf Course in Algonquin. Martinez pitched the idea of creating a nine-hole course to the village back in 2013, and his design was brought to life two weeks ago. 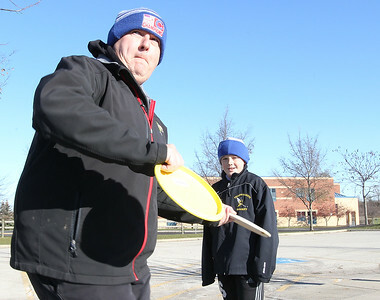 H. Rick Bamman - hbamman@shawmedia.com Avid disc golfer Eric Veljasevic of Huntley makes his second throw on the second hole Wednesday, Nov. 22 on the Quarry View Disc Golf Course desigend by his friend Jamie Martinez. H. Rick Bamman - hbamman@shawmedia.com Algonquin resident Glen Mueller throws from the second tee on Wednesday, Nov. 22, 2017 as his son Max waits his turn on the newly installed Quarry View Disc Golf Course in Algonquin. 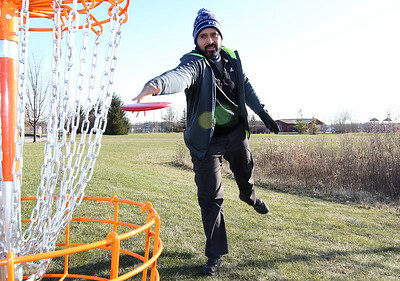 Disc golfer Jamie Martinez plays out of the rough on the second hole at the newly installed Quarry View Disc Golf Course in Algonquin on Wednesday, Nov. 22, 2017. The Algonquin resident pitched the idea of creating a nine-hole course to the village back in 2013, and his design was brought to life two weeks ago.